A bit unexpectedly another pre- Christmas lights opportunity arose last night so I stayed with the Tair 300mm and made an attempt at these fairly bright nebulae in Auriga. 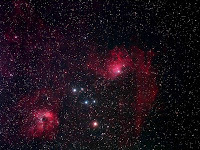 To the right is IC 405 (The Flaming Star Nebula) and lower left is IC 410. The transparency varied quite considerably through the session so it was a bit of a mixture regarding quality that were stacked for the final image. Details: Tair-3S 300mm@F5.6 . 15x 10 minutes @ iso1600 with CLS in DSS, FIV, CS2 & XAT.